Godzilla has proliferated western culture to an incredible degree, but unfortunately a lot of the subtext of his numerous films has been lost in translation. 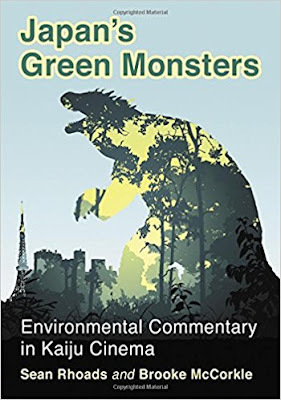 Thankfully, Sean Rhodes and Brooke McCorkle have written an in-depth look at the giant knobby kaiju, entitled Japan's Green Monsters. While most people are at least tangentially familiar with the idea that Godzilla is a metaphor for the dangers of nuclear power, they usually discount the rest of the entries in the franchise as campy fluff (not to say they don't have silly elements to them). The authors take a deep look into several other films such as Mothra (1961), Gamera (1965), and Godzilla vs. Hedorah (1971), all the way up to newer entries such as Shin Godzilla (2016). Each film entry is prefaced with a nuanced look at what was going on in Japanese society during the production of each film and how it affected the message that each one was trying to impart. Starting off with the original Godzilla (1954) the focus is the effects of WWII and the bombing of Hiroshima and Nagasaki--this gave the first film a horrific feel. Then it shifts into Japan's post war recovery which relied heavily on industrial factories and chemicals which subsequently poisoned the landscape and even the people. This idea of industry versus nature was explored in Mothra. The focus on environmentalism continued into the '70s with the the surrealistic Godzilla vs. Hedorah--Hedorah being a literal smog monster. Focus then shifts the the bubble economy of the '80s and the more decadent Godzilla films that followed. Capping off the book is some musing on Shin Godzilla and its parallels to the 2011 Fukushima Accident and the inept bureaucracy that caused it to be a worse disaster than it should have been. 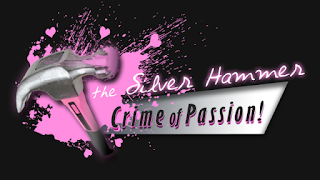 The writing style is on the academic side which might dissuade some readers, but its sheer depth of scope makes up for the slightly dry tone. This book examines all aspects of the movies and a basic knowledge of some film theory terminology is needed to fully understand the points being made. There are several pictures scattered throughout the text, but I would have liked to see a few more stills from the films themselves. Outside of these slight issues the book is outstanding and well worth a read from kaiju fans and cinephiles alike. Japan's Green Monsters: Environmental Commentary in Kaiju Cinema is available through McFarland's website or through their order line 800-253-2187.